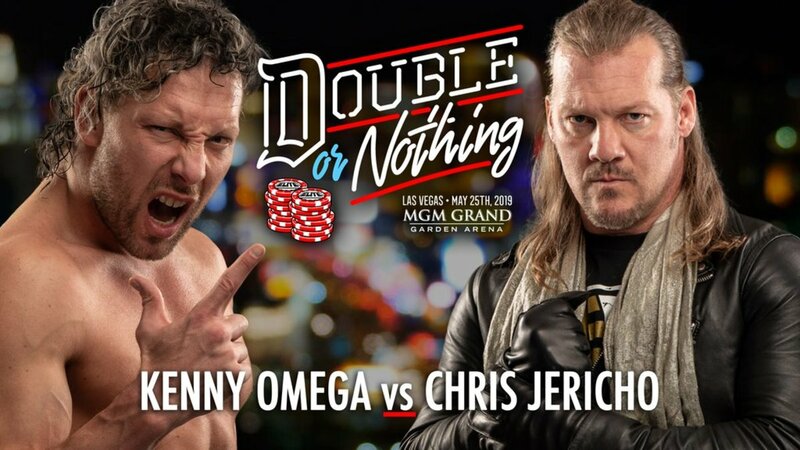 After it was set up at last week's ticket announcement party, Kenny Omega vs. Chris Jericho has been made official for AEW Double or Nothing. Omega vs. Jericho was announced for Double or Nothing at the end of the latest episode of Being the Elite. There was an angle at the ticket announcement party where they got into a pull-apart brawl, with Jericho interrupting Omega after Omega signing with AEW was confirmed. Like Cody Rhodes and The Young Bucks, Omega is an executive vice president of AEW. The first Omega vs. Jericho match took place at NJPW Wrestle Kingdom 12 in January 2018. They were then on opposite sides of a six-man tag match where Omega, Cody & Marty Scurll faced Jericho & The Young Bucks on Jericho's cruise. Jericho appeared at All In and attacked Omega to build up that match. Hangman Page vs. PAC and SoCal Uncensored (Christopher Daniels, Frankie Kazarian & Scorpio Sky) vs. Cima and two wrestlers from China's Oriental Wrestling Entertainment were announced for Double or Nothing at the ticket party. There was also an angle with The Young Bucks and Pentagon Jr. & Fenix, and Nyla Rose went face-to-face with Kylie Rae. The seating chart for Double or Nothing has been revealed. The most expensive tickets cost $211.10, while the least expensive cost $36.70.